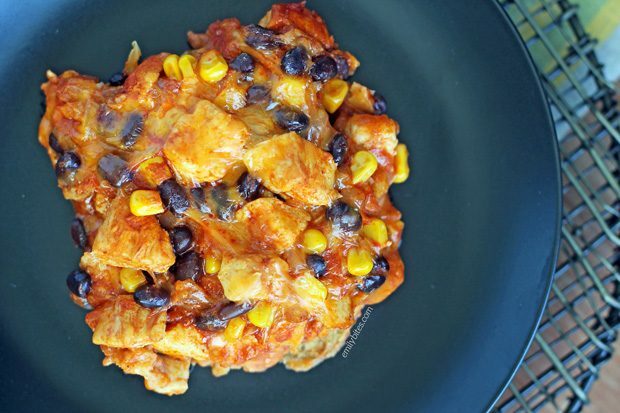 This Layered Chicken Enchilada Bake is like a cross between flavorful enchiladas, a hearty casserole, and an artfully layered lasagna (with tortillas in place of pasta). The flavors and textures are fantastic. 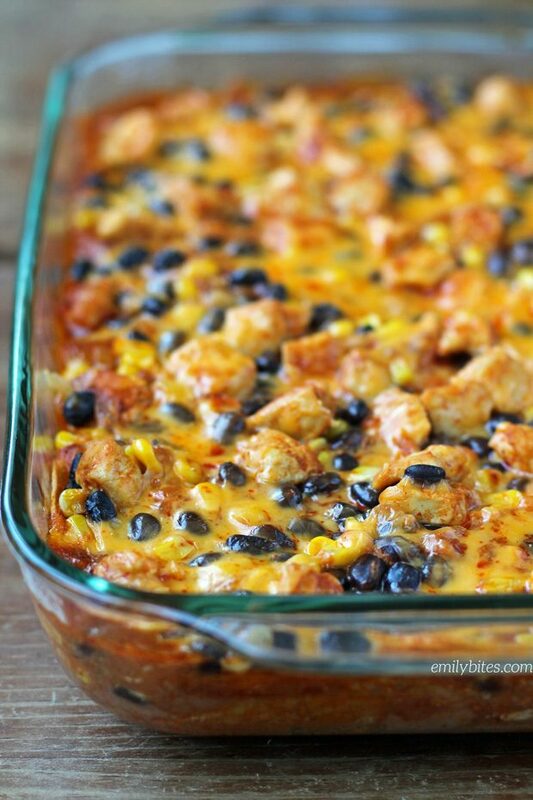 I love the sweet kernels of corn with the zippy enchilada sauce and between the chicken, tortillas and two kinds of beans, this casserole is super filling. Plus, it’s easy to make and you don’t have to roll any enchiladas – bonus! 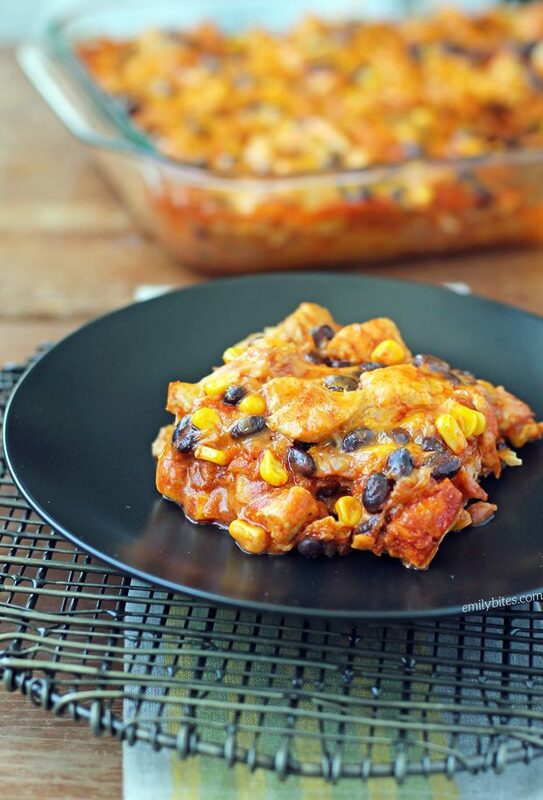 If you love Mexican flavors and you are looking for a meaty, cheesy, saucy casserole that will fill you up and satisfy your cravings, this Layered Chicken Enchilada Bake is for you. Plus, it’s only 339 calories or 5 Weight Watchers SmartPoints per serving – no one will ever guess it’s light! This is a great dish to serve the whole family or to make for guests, because it’s sure to be a crowd-pleaser. Looking for more lightened up Mexican comfort food flavors? Check out the Mexican category in my recipe index for recipes like Spicy Beef Taquitos, Mexi Meatloaf Muffins, Cheesy Taco Pasta, Beef Enchilada Quinoa Bake, Mexican Lasagna Roll-Ups, Shredded Mexican Chicken, Fiesta Hummus, Spicy Taco Gnocchi Skillet, Cheesy Amazing Mexi Rice, Chicken Tamale Bake and many more! Pre-heat the oven to 350. Lightly mist a 9×13 baking dish with cooking spray. Drizzle about 1/3 cup of the enchilada sauce across the bottom of the dish and spread around with the back of a spoon to lightly coat the bottom of the dish. Arrange 4 ½ of the tortillas across the bottom of the dish to cover the majority of the space (my arrangement is pictured above). Use a spatula to spread the refried beans evenly across the tortillas, forming an even layer across the whole dish. Set aside. In a large skillet or saute pan, bring the oil to medium heat. Add the chopped chicken and diced onion and stir to coat in the oil. Cook, stirring occasionally, until the chicken is cooked through and the onions are softened (6-10 minutes). Drain the liquid from the pan if necessary. Add all the remaining enchilada sauce, the black beans and the corn and stir together. Remove from heat. Spoon about half of the chicken and sauce mixture evenly across the top of the refried bean layer in the casserole dish. Sprinkle about half of the cheddar cheese evenly across as well. 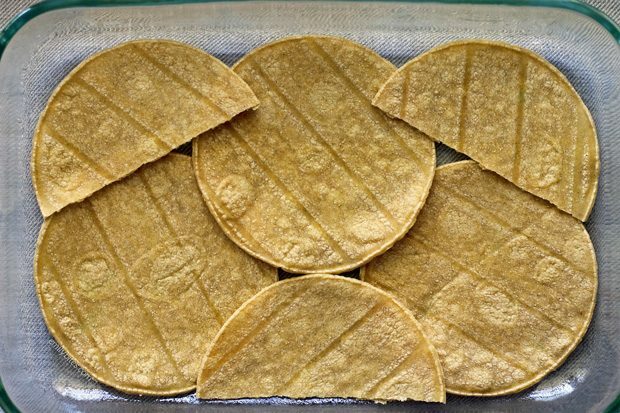 Arrange the remaining 4 ½ tortillas in a similar style to step 1 (I did the same but flipped the layout so any small missing spots from layer 1 would be covered and vice versa). Spoon the remaining chicken and sauce mixture evenly across the newly laid tortillas. Sprinkle the remaining cheese over the top. Bake in the oven for 30 minutes. Cut into 8 pieces and serve. Delicious! Husband loved it too. Next time I will use 1 can mild enchilada sauce and 1 can hot enchilada sauce. I was conservative and used 2 cans of mild. I’m glad it was a hit! This was very good, but it was lacking something….maybe some jalapenos? or something to spice it up. Great basic recipe, but I would recommend adding some more spice to jazz it up a bit! Recipe was followed exactly, but his was completely flavorless and mushy. I would not recommend this to anyone. Looked exactly like the picture. My SO and I liked it. My 6 yr old said it was spicy despite the fact that I used mild enchilada sauce lol. This was SO yummy! Both of my boys LOVED it! Thank you!!!!! I made this last night with some left over grilled fajita chicken and it was so good! I did modify my recipe a bit because I didn’t need to go to the store so I cooked rice instead of the tortillas and I used a can of petite diced tomatoes to carry over the additional can of enchilada sauce I didn’t have on hand. SO Good!!! With some light sour cream and fresh avocado on top it was a family hit! This recipe rocks 🙂 I made it tonight and it is delicious. Has anyone tried freezing the extra servings? I don’t think i’ll be able to finish it all this week and want to freeze a few of the servings for next week. This recipe is soooo yummy. I couldn’t stop at one serving the 1st night. I ate 2 servings. I was glad I had extra points so I could. Wow, went to a WW meeting today and a friend passed me your info. I’ve been on for hours. You rock! BETTER than skinny taste and others. Been there – done that. Your recipes are new and refreshing! Does this freeze well? Anyone know? I made this for dinner last night and OMG, SO good! This is definitely a MUST try! Thank you so much for this recipe. While visiting my family I printed a few of your recipes. This one was made for a family event. Everyone loved it! The recipe is now a keeper for family get togethers. I did cheat a little. I went to Costco and got their package of cooked rotisserie chicken (all white meat) and used that instead of cooking the chicken. It was delicious! THANK YOU! This recipe is wonderful. I have re-joined WW and my husband does the cooking. We both love this recipe and because of great ideas like this we have both lost over 10 pounds each so far. We love this recipe because it gives us a week’s worth of delicious meals and the flavor is wonderful. Made this tonight – using medium enchilada sauce so it would a little spicy and a mix of fat free amd reduced fat shredded cheese (because that’s what we had in the fridge!) and it’s a keeper! My husband usually hates refried beans but they really add to the taste of this meal! Thanks Emily!! I really don’t like refried beans. What could I use in place of them? I’m making this recipe tonight. I too used pre-cooked chicken because I really hate cooking chicken at home. For anyone who shops at Wegmans, they sell grilled lemon chicken breasts in the prepared foods area and it is so delicious. It’s pricier than cooking yourself but I trust that my recipe will come out tasting better because of it (fingers crossed)! Assuming you have to cook this uncovered since there wasn’t an instruction to cover it up? I’m worried it will get a little dry but I wanted to follow the recipe to a t because I am definitely no chef! I hope you love it! If you substitute the chicken with ground turkey is this recipe still 5 SP with the new Freestyle program? I think that chicken and turkey are both 0 points with the new Freestyle program? Has anyone had any success freezing this recipe? I used 1 lb. ground chicken and added canned green chiles. Turned out awesome. Thanks so much!! My husband and I absolutely loved this! We subbed shrimp for the chicken, and it was fantastic! One of the best dishes I’ve made. My husband couldn’t stop raving about it, and that says a lot coming from him. Thank you thank you thank you! This was sooo yummy! I added some Siracha sauce to give it some kick & the flavors are spot on!! Only problem is I made way too much and don’t know how to store this. Anyone have any success freezing & re-heating? Thanks! This was delicious! I used a can of enchilada sauce and a can of tomatoes w/green chiles. I also added 3 TBSP of sour cream and 1/2 package of taco seasoning to the chicken mixture. Followed recipe to a tee..COMPLETELY MUSSY!! Gonna take left overs and use for a dip with nacho chips. Can this be made a couple of days in advance? I have made this recipe a couple of times and I needed to comment that this is a GREAT recipe. Even better the next day. My husband is not a chicken fan so I make half ground beef and half chicken (they do not run together). Husband asked again “is this a WW recipe”? Haha, it is! Thank you Emily! My entire family (picky eaters included) love this recipe. I may try to add some spice next time! Just made this and it was absolutely delicious! Made a few tweaks. Used 1 can enchilada sauce and one can tomatoes with chilies. Just the right amount of kick! Would highly recommend. Very excited for the leftovers. Keep up the good work, Emily! I really enjoy your recipes, decided to try this one tonight and was another winner at our house. I actually put my 1/6 serving piece on a bed of lettuce, topped it with some zero point greek yogurt, and added a little zero point salsa. Perfect dinner size. Thank you for another recipe i can serve the whole house! I made this last night pretty much by the recipe. I used leftover rotisserie chicken 😉 Along with the onion, I sauteed a finely chopped jalapeno as well. Both my husband and father in law(age 85) loved it. My husband even posted pics on his manly hunting forum! I served it with a crispy shredded lettuce salad with a homemade greek yogurt texmex ranch dressing which helped offset the pit of spice from the dish. We declare this a repeat especially during this dang ol’ nasty winter!